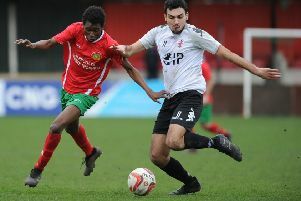 Dewsbury Rangers handed themselves a lifeline of avoiding relegation from Yorkshire Amateur League Division Four as they earned a 4-3 win away to North Leeds Reserves last Saturday. Rangers stay bottom but are now level on 13 points with Beeston Juniors and Thornesians Reserves in the fight for survival. Matthew Harding, Karl Dickinson and Sean Morrell struck for North Leeds but it wasn’t enough to prevent Rangers securing a third win of the season as Nathan Dehaney bagged a brace, while Matthew Briggs and Liam Smith also netted. Norristhorpe Reserves’ hopes of winning promotion are all but over after they threw away a two-goal lead to lose 3-2 away Colton Athletic Reserves. Brad Wild gave Norristhorpe the lead running through onto a long ball to slot home and it remained 1-0 at half-time. Colton went close to equalising early in the second half before Matty Reid doubled Norristhorpe’s lead with a terrific free-kick. Colton pulled a goal back midway through the half and equalised with a tap in at the far post before the home side scrambled a late winner with Albert Mandande, Cameron Rennison and Conor Brown the goal scorers. Wild then blotted his copy book after the final whistle when he was shown a red card. Norristhorpe MoM was shared by Richard Panks and James Hirst. Norristhorpe first team also dropped points in the Division Three promotion race as they were held to a 3-3 draw by Proespect and remain third. Lewis Collinson, Daniel Mountain and Daz Smith were on target for Norristhorpe but they are a point behind second placed Leeds City thirds having played four games more then their rivals. West End Park secured an impressive 5-1 win away to Thornesians Third team thanks to a terrific display by Jonny Asquith.